Soy Sauce Chicken is a classic Cantonese favourite, commonly found in Chinese restaurants and Chinatowns across the world. It’s similar to poached chicken, but infused with soy sauce, aromatics and spices. Soy sauce chicken done right is sweet, salty and aromatic at the same time, which makes it hard to resist. If you have some rose-flavoured rice wine, the flavours are heightened to another level. I used the standard Shao Xing Rice Wine and the result was still good enough to pass. If you’re not confident with carving up a whole chicken, this recipe is perfect for you – I’ve halved the ingredients to cater for the two remaining Maryland chicken I had in the fridge. I do recommend using bone on chicken though, and keep the chicken bone in, skin on. This will help to retain the meat juices and the skin absorbs all the flavour from the soy sauce mixture. 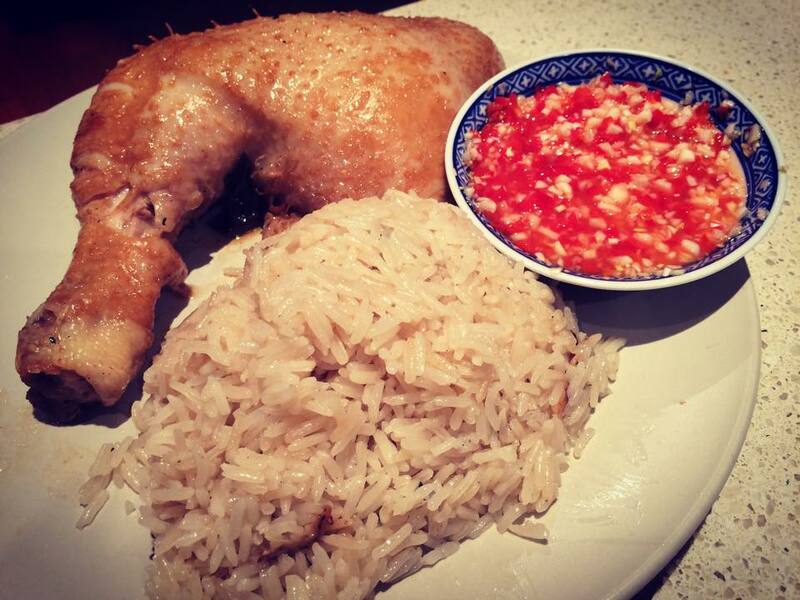 I love eating poached chicken and soy sauce chicken over a bowl of fragrant garlic-ginger rice, similar to Hainanese Chicken Rice and the red chilli, vinegar and garlic dipping sauce. The recipes to make them will be shared in the mini posts tomorrow. Take your chicken out of the refrigerator an hour before you plan to cook and thoroughly rinse the chicken inside and out. Grab your stock pot - It will be a tall, narrow pot that will just fit the chicken, since it should be totally submerged in the cooking liquid. Put it over medium low heat, and add the oil and ginger. Let the ginger caramelize for about 30 seconds. Then add the scallions and cook another 30 seconds. Add the star anise and rice wine, and bring to a simmer to let the alcohol cook off. Add the soy sauce, dark soy sauce, sugar, salt, and water. Bring to a simmer again and cook on low heat for another 10 - 15 minutes. Increase the heat to bring the liquid to a slow boil (not a full-on bubbling boil, but stronger than a simmer). Lower the chicken slowly into the pot breast side up. The chicken should be entirely submerged at this point. Once the chicken goes in, the cooking liquid will cool down. Let it cook for about 5 minutes at medium high heat. If the chicken is not completely submerged, periodically baste the exposed area with cooking liquid. Bring the liquid back up to a lazy simmer, which should take about 10 minutes. Keep it at this slow simmer for 25 minutes. Turn off the heat, cover the pot, and let the chicken sit in the pot for another 15 minutes. Transfer the chicken to a cutting board. Note: Once you're done cooking the chicken, you can actually freeze the sauce/cooking liquid for use again later (though you may have to re-season the sauce).